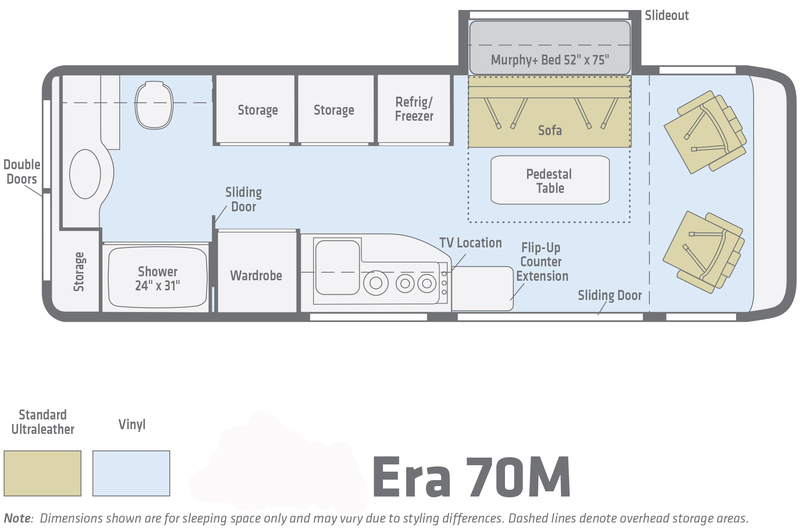 In the motorized RV space, the Class B market continues to grow, in large part due to the success of the Era and this exclusive slideout version with Murphy Plus powered bed. Its combination of fuel efficiency, maneuverability, and high-end features has introduced a whole new set of enthusiasts to the van style RV. With its fuel efficient and dependable Mercedes-Benz diesel engine, driving your Era more closely assimilated driving your own personal vehicle. 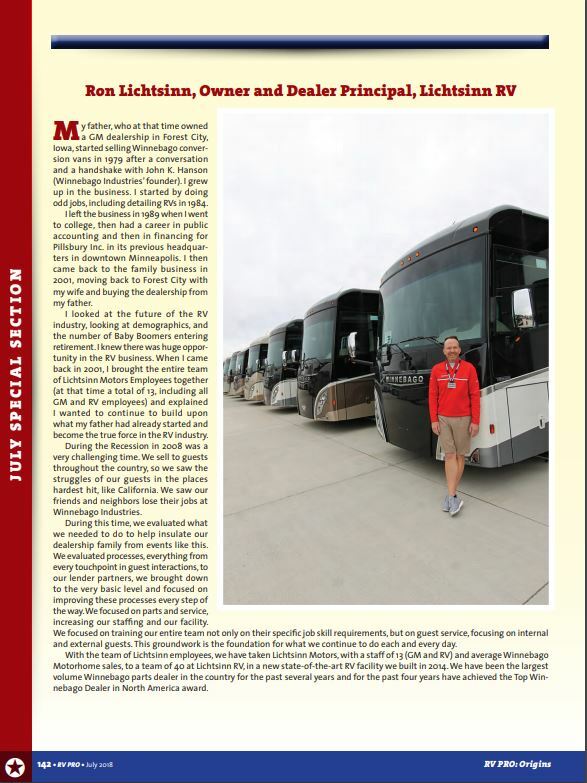 Costing thousands less than Roadtrek and Leisure Travel Vans, the Winnebago Touring Coach Era never ceases to amaze. Watch the Era 70M walk-around video here. 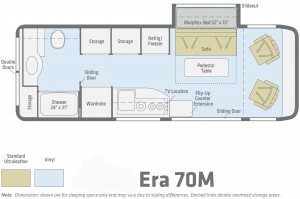 The Era 70M floorplan features a slideout, permanent dry bath, a very comfortable powered Murphy+ Bed, and Truma Combi heating and hot water system for even more indoor enjoyment. Dual door 6 cubic foot compressor driver refrigerator and freezer featuring contemporary flush mount styling and features a quiet, hermetically sealed compressor, which is self-ventilated for easier integration into RVs. The 12V fan aids airflow across the condenser and compressor for improved cooling and features a convenient automatic temperature control with storage for 2 liters, half gallon and full gallon containers. New Firefly multiplex wiring allows single touch controls to lighting, monitoring systems, powered awning controls, energy management and so much more! The Era features the new, 97% efficient, Truma Combi heating and hot water system. Provides quick hot water recovery and heat with LP and electrical heating. New larger bath surround at 24 x 31 inches with a single control shower and faster adjustments to temp to conserve water. Infotainment Center with Rand McNally RV GPS, including an all-new 9 inch higher resolution touch screen color monitor with capacitive touch screen much like an iPad or iPhone, Rand McNally RV GPS safe & easy routing, amenities and tools, trips and content, turn by turn voice guidance, CD DVD player, SiriusXM satellite radio, compass, outside temperature, iPod, iPhone, Siri Eye, audio integration, Bluetooth hands free calling, and so much more. 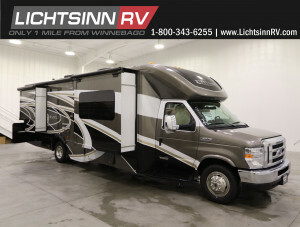 Contact at Lichtsinn RV sales consultant today to find out more about the Winnebago Era 70M! 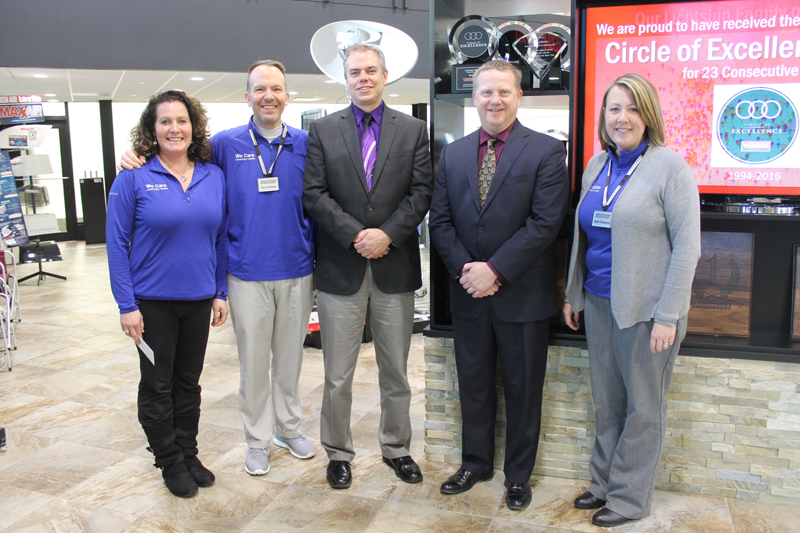 Why buy your next RV from Lichtsinn RV? Beginning the RV lifestyle may seem like a daunting task, but our blog series Affording an RV will clear up misconceptions and reveal that RVing is an affordable, enjoyable way of traveling with family and friends. Why choose specialized RV insurance? Because you want to protect your investment as well as those you love. Your RV, whether it’s new or has some great road-trip miles on it, is a vehicle requiring special consideration. What’s Special About Specialized RV Insurance? This type of coverage extends to you while your RV is parked. If someone is injured at your campsite, your liability exposure is covered up to the specified policy limits. 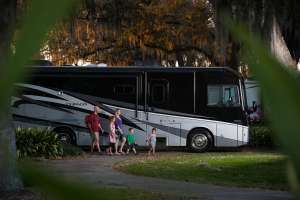 FTC works like a homeowner’s policy for RVers who live in their vehicles full-time and who can be left with potential liabilities exposure, including personal liability and additional living expenses. FTC policies protect full-timers’ unique needs. Designed to reward good drivers by reducing comprehensive and collision deductibles by 25% of your original deductible for each claim-free year until the policy reaches a zero deductible. If a loss occurs after four claim-free years, you pay no deductible on your claim. 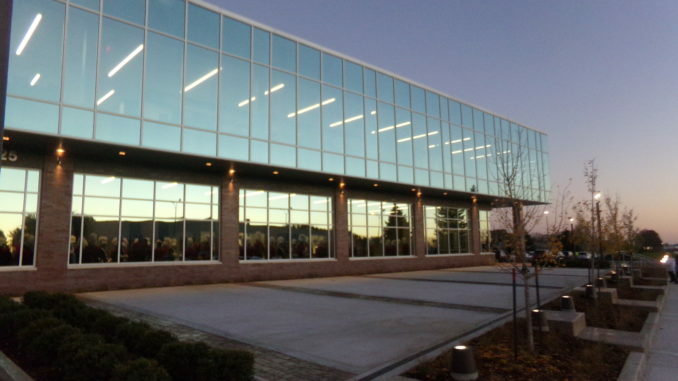 Covers personal property, such as housewares, tools, clothes and sporting goods. A homeowner’s policy may provide coverage, but there are often limitations to coverage for off-premises property, items in storage or belongings damaged in a collision. 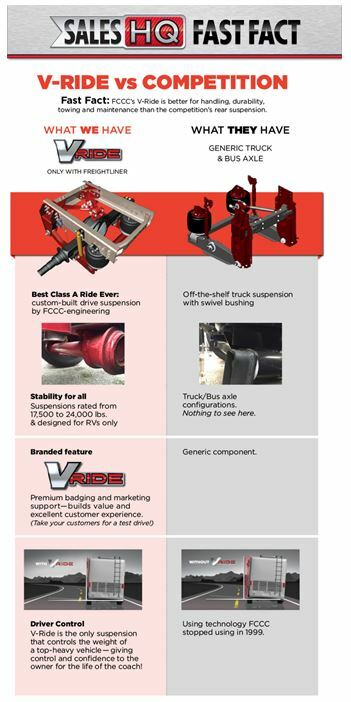 RV specialty policies replace stolen or damaged items at full replacement cost. Be sure to ask about all discounts offered by an RV specialty insurance carrier. Membership in an RV club, supplemental braking systems or completion of a safe driving course are just some of the discounts available on a state-by-state basis. How Do I Find a Specialized RV Insurance Provider? Lichtsinn RV Insurance is offered through the business office at Lichtsinn RV. Call: 1-800-343-6255 to speak with Brandon or Kevin in the Business Office today to find out how we can give you peace of mind that comes with knowing that you are getting the best RV Insurance at the lowest price! If you currently own an RV, review your policy to be sure you have the protection described above at a reasonable price, and then perhaps field another quote for comparison. If you are thinking of buying an RV, be sure to discuss the availability of these coverages with an RV-experienced agent or insurance company. Protect yourself by properly insuring both your investment and the RVing lifestyle you enjoy with specialized RV insurance. To find out more about RV Insurance CLICK HERE or contact a Lichtsinn RV insurance specialist today at 1-800-343-6255! Begining the RV lifestyle may seem like a daunting task, but our blog series Affording an RV will clear up misconceptions and reveal that RVing is an affordable, enjoyable way of traveling with family and friends. 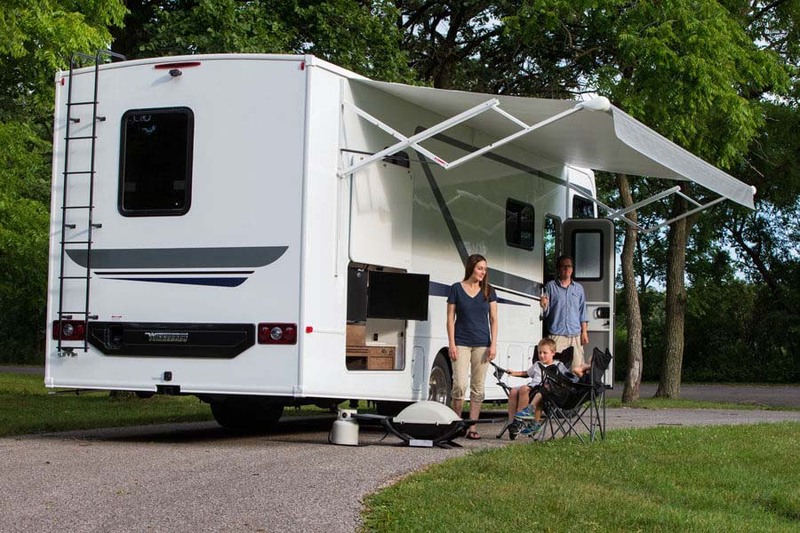 Many RV models allow a family of four to save up to 59% on vacation costs over other forms of travel. That’s a calculation that takes into account RV ownership costs, including payments, insurance, maintenance, tires, tax breaks, registration and depreciation. In today’s economy, there are great deals available on new RV models. Consider pre-owned units for more savings. Financing is readily available for qualified borrowers. You may qualify for a tax deduction because the interest on your RV loan is generally deductible as second-home mortgage interest. Check with your financial advisor to see if you qualify for the deduction. Buying a pre-owned RV is a great way to make your vacation dream a reality for less. Whether you’re looking for a towable or motorized RV, check with Lichtsinn RV because we often receive RVs as trade-ins on new vehicles. Just like buying a pre-owned car or truck, RV dealers provide a thorough predelivery inspection of the used RV. You can visit Lichtsinn RV to compare units and features and to find out about extended service agreements. There’s no better way to try before you buy than by renting an RV. Many people rent RVs simply for a change of pace by taking an RV trip to a special event or destination. You can rent near home and journey to your final destination, or fly and pick up your RV at the other end. 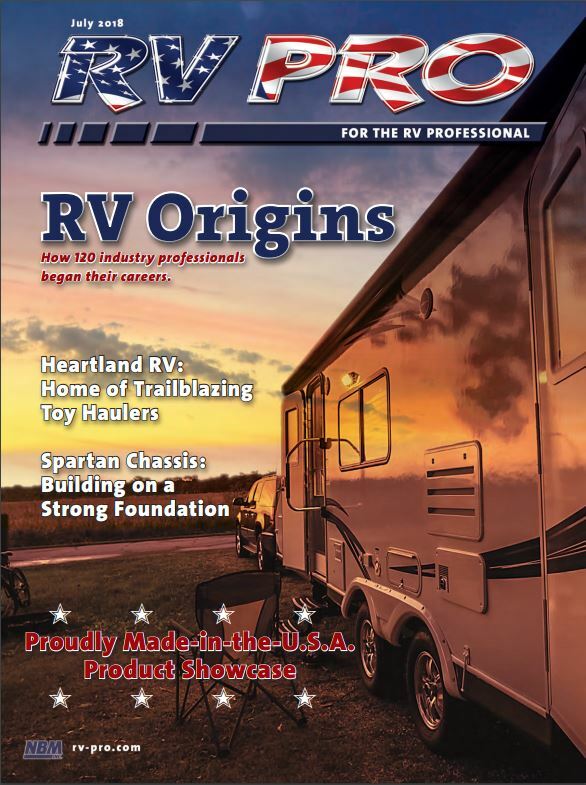 More than 460 national chain outlets and local RV dealerships rent RVs, including state-of-the-art, late-model-year units. A growing number of campgrounds offer on-site RV rentals as well. Even if you’re driving or towing an RV for the first time, features like automatic transmissions, power steering, large external mirrors and rearview cameras make it easy for experienced drivers to adjust to the difference in size, height and weight. Article originally seen on GoRVing.com.